Every teenage girl wants a room she loves. 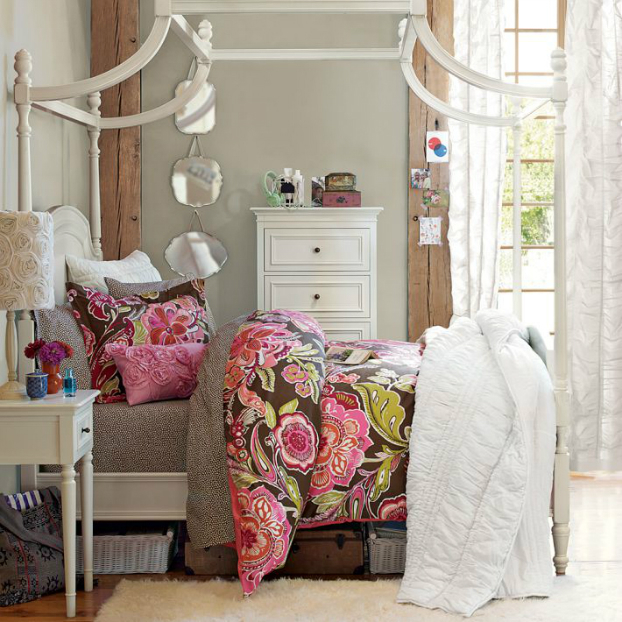 Find new bedding and teen girls’ comforters and sleep in style. Check out these awesome teenage girls bedding ideas by PBteens in colors and styles you’ll love and create the perfect bedding combination. This island-inspired bedding bursts with fresh summertime colors. It’s a perfect layer for warmer evenings, or a soft spot for lounging on. A rainbow of colors zigs and zags its way across pure cotton percale for bedding with standout style. A bold geometric motif infuses our Peyton bedding with sophisticated character. The dazzling design coordinates nicely with a range of different patterns and colors. Real beauty sleep starts here! Rest up under this supersoft and completely chic design. A combo of spring flowers, bold geometric shapes and soft stripes gives the classic patchwork quilt a modern update. Perky petals and beachy blooms are printed in the style of a playful illustration on our supersoft cotton duvet cover. Traditional black and white gets a cheerful twist with flowers dabbed with color. Printed on cotton percale, the stylized paisleys and florals of our Lola bedding pop with premium color. Inspired by the brilliant colors of a tropical garden, our Martina quilt dresses the bed in summer blooms. Each flower and leaf is carefully printed to capture the crisp lines and bold strokes of an artist’s drawing. Show your passion for paisley with our all-cotton handmade bedding. The large square pattern is an updated take on the classic patchwork design. This bedding is pretty and practical, sewn by hand of soft, washable cotton voile and printed with watercolor designs. It has just the right amount of loft for cozy warmth. Double up on bright, bold color and pattern with this top-quality quilt and sham. The reverse is a dottie print for a completely different look. A whimsical print in a fresh color combination bursts across 100% cotton percale. Even better, the printed reverse gives you two duvet covers in one. All of these are so beautiful…is there a way you could order any of these sets?